After the wall coming down, the new one is beginning to go up. 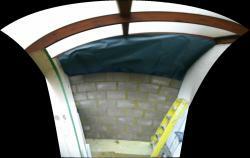 The picture of the work in progress has been distorted by the image stitching software, but I like the effect. Today the rest of the roof comes off. The building work has been accompanied by flooding and more bad news about foundations and wet rot. However, now we’re at that punch drunk stage, where you just want it to finish. Despite the noise and regular tea making duties I delivered the latest full draft of the Birmingham Rep play on Monday. I haven’t re-read it yet, but feel the weight. We hope to have a day’s work on it at the theatre soon. The Climb had an unexpected outing this week. Birmingham City University re-opened their library with a series of readings from writers (including Jim Crace) and an extract from The Climb featured (I teach at BCU, formerly UCE). Apparently it went down well. After The Climb and Kind of Dark – both positive experiences in themselves – I was pretty drawn out. The Climb got a kicking on the BBC Message Boards and there was a chance of me getting very negative very quickly. So I went to another place, and it’s been a different sort of Summer. I am physically fitter, the house looks better and there are new qualifications on the horizon. But now playwriting beckons again. There’s another deadline on the horizon and, to help the necessary change of state, there’s been an enquiry about an older play. Hurray. As with all deadlines there’s been a lot of displacement in the build up. For the last few days I have been rebuilding the office, continuing unpacking (we’ve only been here a year), filing and form filling (the tax return is still to come though). I suppose the blog is part of the same process – trying to creep up on the writing without it noticing. >Kind of Dark has been in rehearsal the last couple of days. Suzanne Bell is directing Mark Arends and Raquel Cassidy. Amazingly, it goes live on Sunday at 5pm and 8pm. The other writers in the show are Glyn Cannon, Stephen Sharkey, Nancy Harris and Frederic Blanchette translated by Christopher Campbell. There’s a full running order at www.miniaturists.co.uk. Book tickets (£9 / £7 concessions) at arcolatheatre.com or on 0207 503 1646. I’ve been working on a schools project in Tottenham for a couple of months and selected plays are being presented at a show at The Arts Theatre in about ten days time. It’s been a great project. The pupils have written a wide range of really theatrical pieces. I’m looking forward to the show to see what the other schools have created as well. My Birkbeck students have also delivered their plays. Two good, strong groups. A couple of weeks of tutorials and then I’m done for the term. The radio play is in The Radio Times, but they’ve spelt my name wrong – ‘Goodman’ rather than ‘Woodman’. It’s right in the online version. I’ve been sent a copy of the final edit and I think it’s really wonderful – the disparate strands edit together beatifully and Soweto’s music really works. Wednesday, 2:15pm. > Back home after a couple of days away. The recording of the radio play went well – great performances from Paul Clarkson and John Flitcroft. It was a fun production with John pedalling away on a static bike while Paul jogged back and fore to simulate riding with him. Thanks to all involved (Paul, John, Peter, Rosie, Michael, Cath and Christina). Now they’ll edit a rough-cut of key passages and record the music in time with them. I’m looking forward to hearing Soweto’s music. The full edit should be available mid-June. And did I mention that it’s broadcast on JULY 4TH. P’s son J is home from two years abroad. We’ve moved house of course, but he still found us. It’s good to have him around again. The picture on the left is from the 1964 Tour de France. 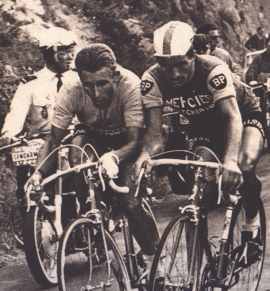 Jacques Anquetil (5 time winner) goes shoulder to shoulder with Raymond Poulidor (‘the eternal second’) on the Puy de Dôme. Poulidor eventually broke away to win the stage, but Anquetil took the race. Anquetil is the only TdF winner to admit to doping before today. >On Thursday I’m off to Birmingham for the recording of The Climb, my radio dramadoc destined for Radio 4’s Afternoon Play slot on July 4th. Soweto Kinch‘s music has been commissioned and will be recorded soon after. Soweto’s musings on moments of transcendence have been recorded (produced by Rosie Boulton) and edited into the script. The drama producer Peter Leslie Wild has cast Paul Clarkson and John Flitcroft as Clive and Billy. All I have to do is cart my bike to the studio and watch them work. Looking forward to it. Tomorrow is my first full session with the pupils in Tottenham. I’ll spend a lot of today working out how the session might go. Wednesday is the two Birkbeck sessions. Friday will be in Brum again to pick up marking. Busy-ish week. I see that Hampstead are about to produce the follow up to Nell Leyshon‘s Comfort Me With Apples. I had hoped it would be called Pleasure Me With a Banana, but it’s actually titled Glass Eels. Should be worth a look.